FROM BACH TO THE BEATLES! From time to time, customers ask whether it's possible to book an alternative type of music or musicians for part of the day's celebrations, especially for very important occasions like Weddings (music before/during/after the ceremony, greeting guests at Reception etc). 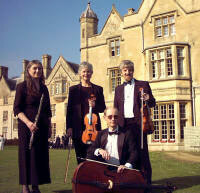 However, such music and entertainers are not within our specialist role and we would not dare to pretend otherwise. But, in an effort to help our customers seeking such services. We have co-operated with this agency on numerous occasions and know that they will offer equally specialist advice in your search for classical music - please click here to visit their website where much more information (sound samples, background information regarding the artists) is available about the classical, jazz ensembles and solo or duo artists such as harpists, pianists and the like available throughout the UK. It is just not possible to give the full range of their music on this single page - please feel free to visit their website and leave your enquiry directly with them.